Will you indulge old Gaffer’s Home Brew? While it isn’t Bilbo’s 111th birthday, it is a special day for fans of Tolkien as Frodo and Bilbo are said to both have been born today, by Shire Reckoning of course. Add to that the fact that "The Hobbit" was first published this week in 1937 and you’ve got the makings for a party of special magnificence! 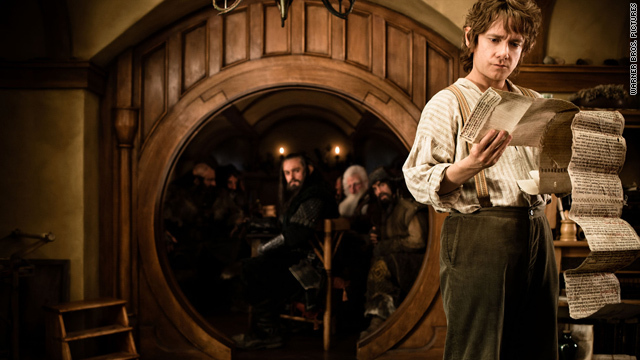 Tolkien fan groups have parties planned at which books are discussed and movies are watched. Cookies, honey cakes and even Lembas (Elven waybread) are among some of the Middle-earth themed snacks that can be found at these gatherings. "Lord of the Rings" cosplayers and casual fans alike can indulge their “inner Hobbit” by going barefoot to celebrate. “Hobbit Day” has been observed for over 30 years and with the films in production, the event will only surely grow as the upcoming "Hobbit" films near completion. Do you have any plans to celebrate? Great post. I used to be checking constantly this weblog and I'm inspired! Very helpful info particularly the closing section 🙂 I handle such information a lot. I used to be looking for this certain information for a very lengthy time. Thank you and good luck. I kinda remember a website that gives you an Elf name, is that cool. How long will the movie be? And how much LOTR stuff will be added? I'm reading the Fellowship for the fourth time. Still learning. I wonder if its better in Spanish. How does Frodo change? He is different from other Hobbits by his "learning" which was encouraged by Bilbo. They both have that weird blood or genes, Took. They don't have girlfriends in the novels so what do they do in their spare time? Talk to Elves...Elfs? Thank you. I always tell my husband he has hobbit feet because they are wide and hairy, I always called him bilbo and ive started 2 call our son frodo...but them big hairy feet helped him move quick when he was in the marines! He was one of the lucky ones who made it home! But no wer not gonna celebrate hobbits bdays. Weve got more important things to worry about lk how come the military will take a kid outta high school and make huge promises about how theyll take care of u the rest of ur life and educate u and when u get out u cant get a job because u really have no educaton other thenmilitary stuff and have to liveoff minimum wage at a crappy job while trying 2 support ur family off $10.25 hr. Hmmm not cool when ur a 30 year old disabled veteran. Happy Birthday to Bilbo & Frodo & Happy Hobbit Day to all!!!! Wearing the One Ring, my prancing pony staff t-shirt, and I made sure to have time for afternoon tea today. For later: an all out birthday party for Frodo and Bilbo. Cake, decorations, movie soundtrack in the background, and, of course, lord of the rings risk! Wearing the One Ring and my prancing pony staff t-shirt of course! And later having an all out birthday party for Frodo and Bilbo! Birthday cake, decorations, movie soundtrack in the background, and of course, lord of the rings risk! Live long and prosper, Tolkien fans! And I am barefoot right now. Happy Birthday to Bilbo and Frodo~!! Ah, this explains why so many peple have been coming up to me today and saying "Can you help me out? I'm a little short today." Well, I plan to take my uncle's old ring, go to bree, get attacked by ringwraiths, go across Caradhras, fail there, go into the mines of Moria, see my lovely old wizard friend die, go into the wood, sail by a boat, get attacked by orcs, run from everyone with my best friend, tame Smeagol, see the Black Gate close, go into Ithilien, get captured by Faramir and the other men, been released, see the army of Mordor at the Minas Morgul, climb the secret stares, see a big spider who stings me, get taken to some tower, get saved by my best friend, go to Mordor, destroy the ring, go to see the king get crowned, come back to the Shire, hug my best friend and sail into the west... Yea, I can do it all in one day, wanna bet? Don't forget to scour the Shire, get rid of an evil wizard, and finish your book before you leave! I was always disappointed to have missed Bilbo and Frodo's birthdays by 2 days, except I really do prefer being a Libra and having a birthday on the first day of fall. Many happy returns of the day, Gentle Hobbits! Okay... so... how PISSED are you that creative mode in Beta finally came out? I just wasted like five months building an epic palace in Survival mode, and all of a sudden, I can do it in like a week with Creative! Thankful and mad at the same time is a weird feeling. i ate 3 breakfasts this morning. what's a hobbit? I'm going barefoot today, and eating a stew cooked over a open fire tonight. Seriously, I am. Here's some serious hobbit fans http://roadtotheshire.com/ I wish I had their guts. Long live Bilbo and Frodo Baggins! I have loved The Hobbit and LOTR since I was about 12 (over 40 years ago) and can't wait for The Hobbit to be released next year! Coincidentally, or not, I celebrate it every year as I share my birthday on this most glorious occasion. I would have plans to celebrate Hobbit day... if I didn't have a job... and I was still 14 years old. I think you're confusing it with Harry Potter. Never read the hobbit, but they are pretty funny looking. MD looks like a doctor, but has a very familiar name.